Nicaragua's Embattled Government Tries To Silence Independent Media International press organizations are criticizing the media attacks in Nicaragua, which include torching a radio station, stealing equipment and cutting off TV networks. 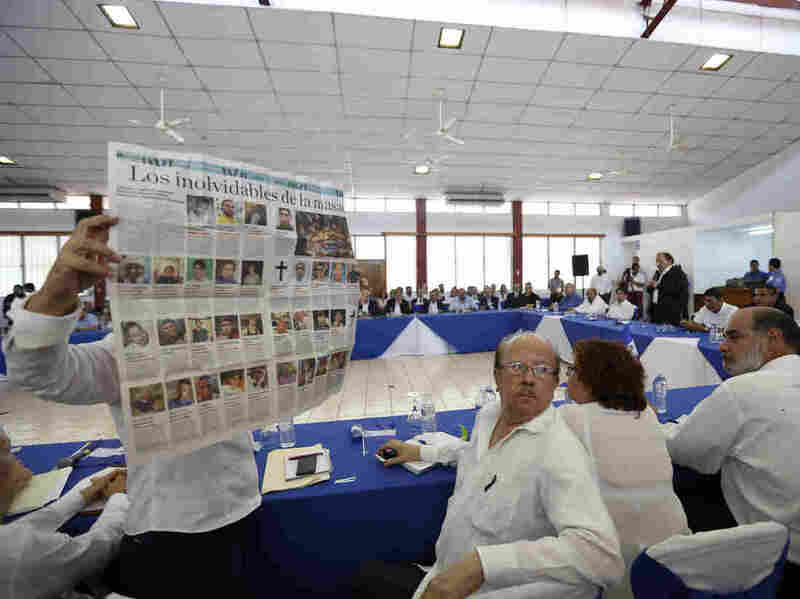 A woman holds up a Nicaraguan newspaper that published images of some of the people who have died in recent protests there, interrupting Nicaraguan President Daniel Ortega at the opening of a dialogue between the government and opposition and civic groups in Managua, on May 16. As the months-long crackdown on opponents of Nicaraguan President Daniel Ortega drags on, the small independent press in the country is coming under harsh attack. One reporter has been killed, and dozens more say they have been beaten and threatened. Many reporters have fled or quit the profession. But a determined group of journalists remains. They include reporters like Julio César López Chavarría. The 32-year-old is deep in the crowd of a recent anti-government protest at a busy traffic circle in Managua. He pulls out his selfie stick, attaches his phone to the end and starts transmitting live to his website, Onda Local. "Good morning, friends of Onda Local; thank you for following us on Facebook Live," starts López. He continues on with the latest numbers of victims of the government's crackdown: at least 317 killed and thousands injured by masked armed supporters of Ortega, according to nongovernmental organizations in Nicaragua and the United Nations human rights agency. The unrest is something López, who has worked more than a decade as a radio and multimedia journalist, knows all too well about. 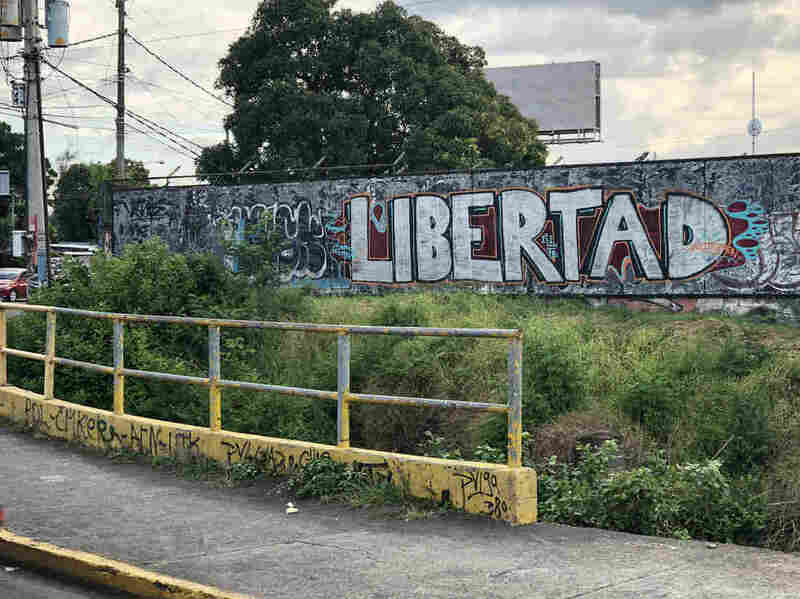 "Freedom," says this graffitied wall in Managua. Many walls are filled with painted slogans around the capital. And many have been painted over quickly after they are put up. Anti-government protests demanding that Ortega step down have been ongoing since April. The transmission ends abruptly. López says he doesn't remember much after being struck in the head. He woke up the next day in a local hospital. "I don't know any journalist here who isn't afraid of being attacked," López says at one of Onda Local's makeshift newsrooms, a conference room in a friend's office. The crew of four reporters usually works out of a production studio in another part of the capital city, where it produces a weekly two-hour radio program. The studio, however, is right next door to a busy government office. Fearing retribution, reporters work there as little as possible, López says. Last year, the radio network that carried Onda Local canceled it after pressure from Vice President Rosario Murillo, who is Ortega's wife. It now airs on a low-power university station. "The government wants to silence us, but they haven't been able to," López adds. 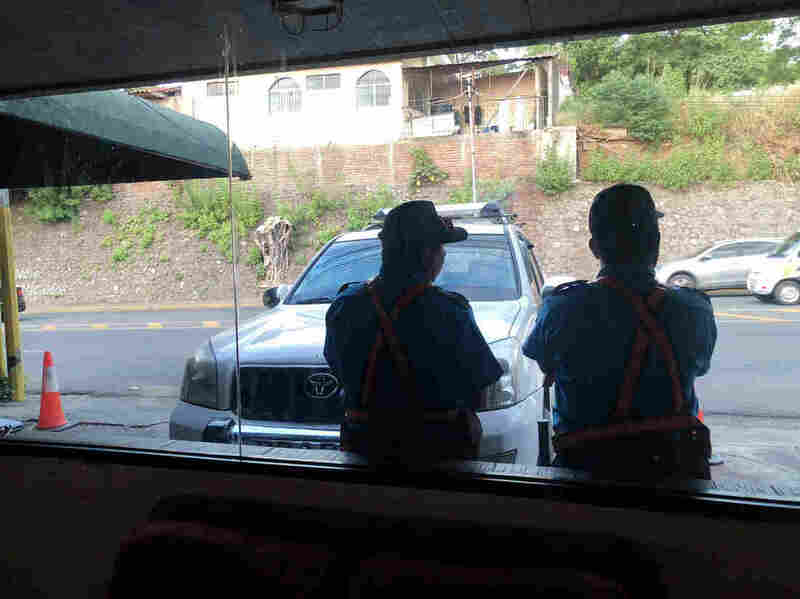 Private security agents guard the offices of 100% Noticias in Managua. The cable news network has come under attack by supporters of Ortega and scrutiny from government censors. According to the network's owner, Miguel Mora Barberena, a government minister warned him to "lower the intensity" of coverage after nationwide protests against the Ortega regime broke out in April. International press organizations have criticized the government's media attacks, which include torching a radio station, stealing equipment and cutting the transmission of nongovernmental TV channels. During a recent fact-finding mission to Nicaragua, Gustavo Mohme, president of the Inter American Press Association, urged Ortega to respect the free press. "Stop the hostilities, stop the attacks and stop harassing reporters," he said. Mohme and several members of other press freedom groups asked to meet with Ortega. The reporters say they never received a response to their request. Ortega has called his opponents violent "terrorists and coup-mongers" that must be stopped to bring peace to the country. His attacks on the media have only intensified. Last week, government auditors said they were investigating the general manager of Channel 10, the only television station in Nicaragua with critical coverage of the government. In a short communiqué, the government accused Carlos Pastora of money laundering. He denies the allegation. Pastora, who is a citizen of both Nicaragua and Honduras, has been holed up in the Honduran Embassy in Nicaragua after being stopped by immigration officials on his way to a flight at the Managua airport. He says he is worried for his safety and that of his family. Press groups, including the New York-based Committee to Protect Journalists, say the move against Pastora is an escalation of the attacks on Nicaragua's remaining small independent press. Most Nicaraguan news outlets are controlled by Ortega's government, his family members or their allies. But as the crackdown continues, that near monopoly appears to be crumbling, especially among outlets once seen as more sympathetic to the government. 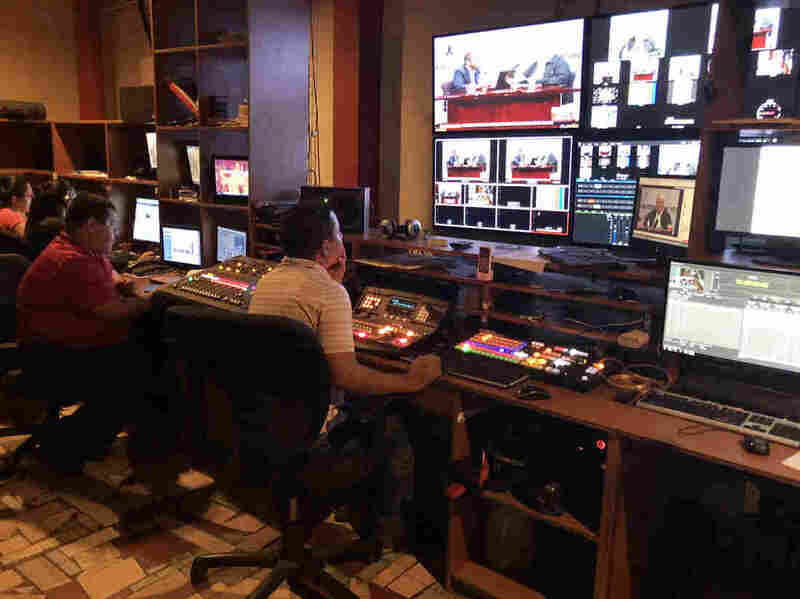 In the control room at 100% Noticias ("100% News"), Nicaragua's only 24-hour cable news network, a popular afternoon talk show is ready to take a break. The director counts down "three, two, one" and cuts to commercials. The production crew of 100% Noticias, Nicaragua's only 24-hour cable news network, watches over a popular live afternoon talk show. Reporters from the network say they have been threatened, robbed and beaten by Ortega supporters. Only one reporter, out of 15 on staff, has quit, according to network owner Mora. Last April, government censors cut 100% Noticias from the airwaves for six days. The network's owner, Miguel Mora Barberena, says a government minister had warned him to "lower the intensity." Mora, who is 53, characterized his past coverage of the government as neutral. He says he refused to follow the government's request to tone it down. "When they censored us, the people felt censored too, and soon we became the banner for the repression of the free press in Nicaragua," he says. 100% Noticias' ratings have skyrocketed since the station went back on the air, along with the number of visitors to the station's website, says Mora. He says the site has received more than 3 million visits since the unrest began in April. There are no independent ratings agencies for cable TV, and NPR was unable to confirm the ratings bump. However, Mora does appear to have many new fans. At a recent anti-government rally, people lined up for photos with him and hugs. Marcher Amparo Guadalupe López thanked Mora for his coverage, which she says is the most honest there is in the country. "He is in my heart and in the heart of all Nicaraguans and so are all his brave reporters," she shouted over the loud chants of the protesters and horns honking. Mora relishes the attention and says he feels the responsibility of his new critical role. Several of his reporters have been beaten by pro-Ortega supporters, and he has had three expensive TV cameras stolen. "We've opted to be on the side of the people in this fight," he says. "When people are being killed, tortured and threatened, there is no way you can stay neutral anymore," he adds.